It has been great fun connecting with some amazing and encouraging women all over the world in our new Wise Woman Builds Titus 2 Facebook Group (if you haven't joined yet, you are definitely welcomed to and we would love to have you)! 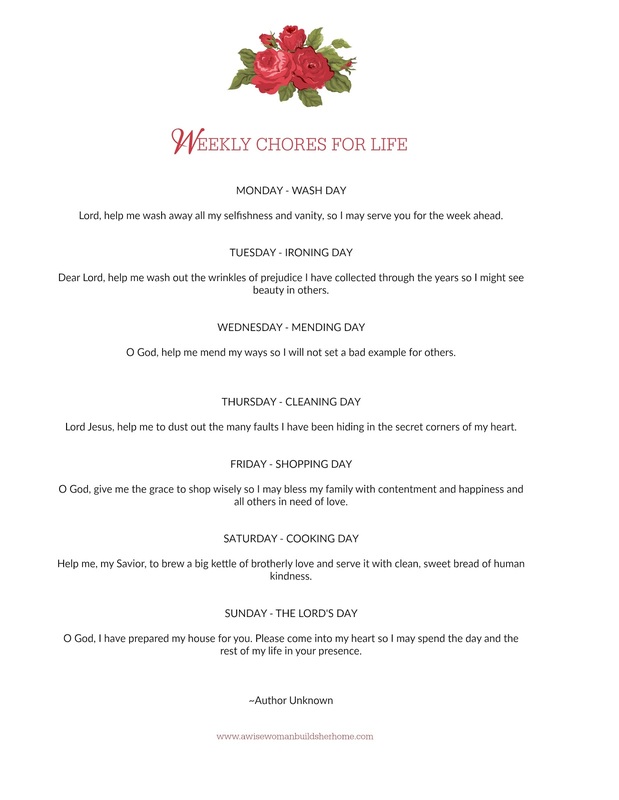 Recently a sweet gal from the group shared a wonderful "chore" list that will encourage you to keep a biblical focus through the week that she said she keeps next to her "real" chore list. 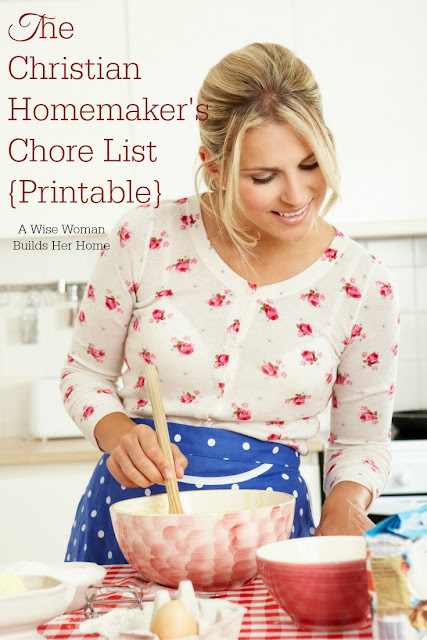 I thought it might inspire you especially with it being the first day of Spring and we all know that spring cleaning will soon be on the way in most of our homes! Lord, help me wash away all my selfishness and vanity, so I may serve you for the week ahead. Dear Lord, help me wash out the wrinkles of prejudice I have collected through the years so I might see beauty in others. O God, help me mend my ways so I will not set a bad example for others. Lord Jesus, help me to dust out the many faults I have been hiding in the secret corners of my heart. O God, give me the grace to shop wisely so I may bless my family with contentment and happiness and all others in need of love. 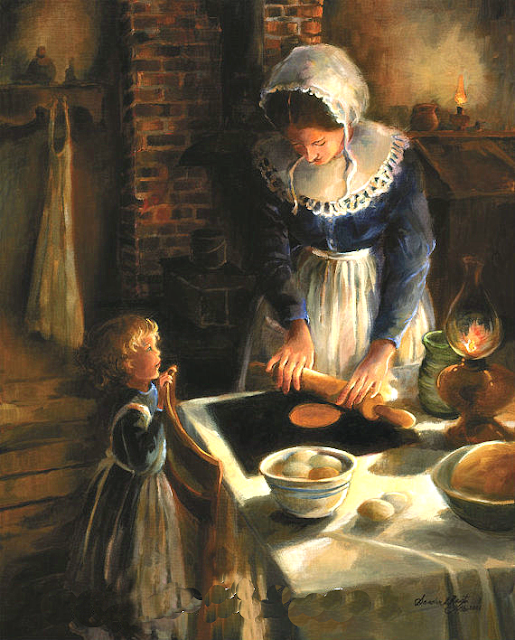 Help me, my Savior, to brew a big kettle of brotherly love and serve it with clean, sweet bread of human kindness. O God, I have prepared my house for you. Please come into my heart so I may spend the day and the rest of my life in your presence. Let it be our prayer to keep Christ first and center in our homemaking and all the other important things that we do on a daily basis! If you would like to print this out, just click on the printable below, right click and open a new tab, zoom in, and then print. Super easy! I hope it is a blessing to you! 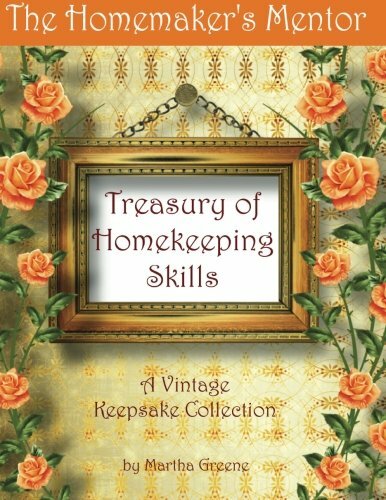 Delightfully illustrated and filled with practical, proven "hands on" advice and inspiration for the homekeeper, this volume also has plenty of room for you to personalize it with your own snippets, recipes and annotations, and pages to journal in your own handwriting, keeping the way "Mother always did it" from becoming forgotten in this ever-changing world. The information in this volume, plus the unique touch you can add to it, will make this a cherished heirloom treasured by family for years to come. Note: This post contains affiliate links---thanks for your support! I love the chore list. It'so important to have those heart attitudes! Thanks, too, for hosting. 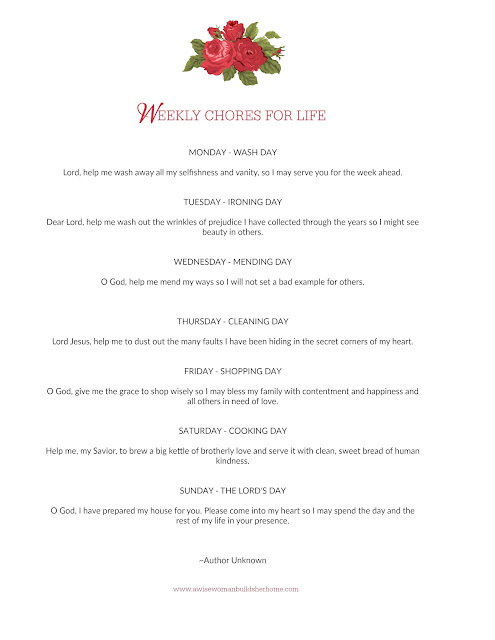 When I first saw this, I was like, "why a christian chore list? What would make it different from a secular one?". Then, I read on. Haha. Great list to help us think about the inside, while cleaning the outside.